- 1909 STEEP(39) reported the existence of a liposolube substance in an egg extract, fundamental for the life. - 1913 McCOLLUM AND DAVIS(30) discovered the liposolube substance, "Fat Soluble N", which stimulated growth in rats. - 1920 MOORE(29) established a relationship between a deficiency of fat soluble A and the incidence of xerophthalmia and night blindness. - 1931 KARRER et al(20)determined the retinol's chemical structure. - 1935 WALD(47), discovered that night blindness is caused by a deficiency of rhodopsin, a photosensitive protein found in the eye and activated only in presence of vitamin A. - 1937 HOLMES AND CORBET(l8) isolated natural vitamin A in the fish liver oil. - 1946 ARENS AND VAN DORP(2) synthesized vitamin A chemically. - 1962 STTUTGEN(41) made the first clinical analysis of vitarnin A influence in the hyperkeratotic disorder. - 1968 KLIGMAN(21) makes the first clinical analysis of vitamin A influence in the acne disease. - 1971 Johnson & Johnson(31) obtains FDA clearance for the utilization of 0,1% of retin - A on acne treatment. - 1985 ORTHO, R.W. Johnson Pharmaceutical Research Institute(31) initiates the analysis of Retin-A application on skin tissue damage caused by light exposure. - 1987 ORTHO(31) starts an experimentation with a tretinoine based emollient cream. - 1989 ORTHO(31) finishes his experiment. FDA (Food and Drug Adrninstration) recommended daily dosis of vitarnin A are: 5.000 IU for adults and 1.500 for children. One IU equals to 0,6 mg of beta carotene or one retinol equivalent; one IU is also equal to 0,3 mg of all-trans retinol or 0,344 mg of retinil acetate. The cells related to vitamin A are mainly found in the cells of the integument system, kidneys, testicles, prostate gland, mammary tissue, liver, lungs, retina, uterus colon and thymus. 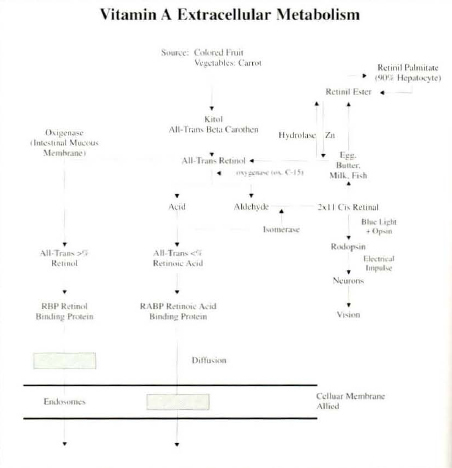 In the extracellular metabolism, cell absorption of the vitamin A biologic active elements depends upon innumerable factor, such as: pH, enzymes, low calcium concentration, Mg+ ions, mucous membrane receptors saturation, ATP, light stimulus, etc. CARR in 1926(8) and CANTAROW in 1969(7) have demonstrated in vitro that the retinal absorption spectrum at the 345 nm level, corresponds to violet-blue visible light spectrum. In 1968, ESCRIBANO(14) has also demostrated in vitro that HC - PROTEIN (Alfa 1 micro globulin) is present in human plasma as a free monomer or as an HC-IgA protein complex. He also demonstrated that HC protein is hererogeneous and most often behaves like a yellow-brown fluorescent chromophore, identified as retinol. Chromatography has shown that at an absorptance level of 30 nm, HC-IgA protein complex has maintained stable for a longer period. However, with the ultra-violer light spectrum, that stabiliry was destroyed. Just to register the HC protein has been identified as all-trans retinol and classified in the lipocalins group by analogy with its aminoacids arrangement in the molecular chain(33, 26). Lipocalins are responsible for the transportation of small lipophilic bio-molecules (that is, retinol). Beta-lactoglobulines have also been found carrying chromophore pigments. Based on chromatography analysis, KUTNER(23) reported in 1986 that all-trans retinoic acid, 13-cis retinoic acid and beta-retinol glicorunide forms have all been considered biologically active and efficacious within a light absorptance level of 340 nm. According to GLOVER(17), retinol maintained its stability for longer period of time when RBP (Retinol Binding Protein) complex was in association with tyrosinc. He also reported that the RBP level in the serum is affected by a low proteic diet (mal-nutrition) and by zinc deficiency. TANNER(42) in 1962 has reported that children develop better in the summer than in the winter. He also detected that RBP levels in the blood plasma are higher in the morning and progressively decrease from morning ta evening. 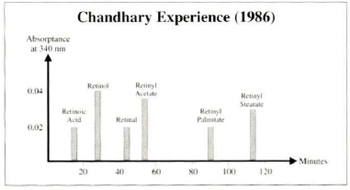 In 1986 CHANDHARY(9) reported an in vitro experiment with rat testicles. After injecting all-trans 11-3H retinil acetate and separating the metabolites through a high performance chromatographic solution he obtained retinoic acid at an absorptance level of 340 nm, 20 minutes after starting the experiment. STRYER(40) has shown that by analogy in the vision cycle the chromophore pigment of retinal cones is the cis-retinal which when exposed to light (visible spectrum) associates with protein at an absorptance level of 340 nm. Vitamin A is essential to simulate growth. Its properties are observed in the development of the bone tissue, the normal reproductive process and the vision system. Even more important is vitamin A's role in the differentiation of mucous secreting epithelial tissue as demonstrated by WEBER(48) and its anti-oxidant action as a chemiopreventive, MALONE(27). Vitamin A relationship to the hyperkeratotic syndrome was first clinically diagnosed by STTUTGEN(41) in 1962. Supported by his experiments with retin-A for ortho diagnosis (R.W. Johnson Pharmaceutical Research Institute), in 1968 KLIGMAN(21) was the first to clinically associate vitamin A with the problem of acne. He began vitamin A treatment for skin alterations, mainly Photo Aged Skin. In the microscope and clinically, ELLIS(13) has demonstrated the positive effects of the topical application of a 0,1% (1,000 mg/ml) tretinoine based cream - that is, all-trans retinoic acid - on a photo aged skin. 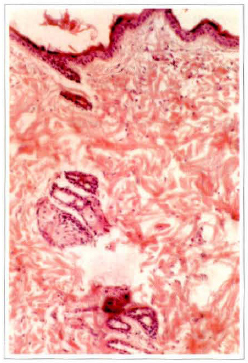 He observed a decrease of the corneal layer and an increase of the granular layer with a higher thickness of the epidermis, an increased number of mitosis in the keratinocytes, the presence of glicosaminoglicans and an increase of the supportive fibrilis in the intersection of dermic and epidermic layers. The first evaluation was completed in 4 months. After 22 months a new evaluation was completed showing a significant decrease of thin wrinkles, creases, as well as an improved skin texture and elasticiry. No collateral effects were observed, confirming KLIGMAN(22), LASNITZKI(25) and WILSON(49) findings. According to JARDILLIER(19), retinoic acid is more efficient than retinal due to the fact that it does not call for glycolization in order to generate glicosaminoglicans (which maintain the fibronectines existence). Retinoic acid acts synergistically with the thyroidal gland hormone (both have the same receptors) to increase cellular growth by increasing the production of the growth hormon liberated by the pituitary gland as demonstrared by EVAN(15) in 1988. In 1990 BAILLY(3), identifies colagenases (metaloproteins from dermic papillae) produced by fibroblasts, monocytes and keratinocytes that are inhibited by the retinoic acid. This would lead to an improvement of the skin and other therapeutic effects. Tretinoine (retin-A topic) restores the epithelial maturation bringing the folicular infundible to its normal state, thus producing an ordered desquamation and preventing comedones formation (BIERMAN(4), 1988). Patients with acne have a lower RBP concentration in the serum. An adequare vitamin A level is essential to control the epithelial differentiation while its excess normalize the keratinizarion, reduce the chronic eczema and lichen-planus. In these pathologies there is a high concentration (2 to 3 times over) of dehidro-retinal in relation to retinal (reduced to its half level). Taking in account that retinol (RBP) level in the serum has remained normal, it is possible to conclude that there is a local change in the Vitamin A inter-cellular metabolism resulting in skin inflammation and hyper prolifaration of epidermic cells. This inflammation is of unknown origin. Acid vitamin A positive effect in case reports to the fact that it is directly related to its immune-regulator effect (ROLLMAN(35), 1985). MESIEWCZ(28) 1991, has reported an evident improvement of acne keratosis with twice a day use of topic application of 0,05% tretinoin, during 16 consecutive weeks. Vitamin C and/or beta-carotene reduces oral leukoplasia acting as an oxidant in the chemioprevention, SINGH(37) 1991. Rats and rabbits submitted to daily topic doses of gel tretinoin of up to 50 times over than those recommended for humans (human dosage is 500 mg of tretinoin gel daily), have not shown changes in their reproductive capacity or in the embryotoxic effects. Johnson & Johnson 1989(31). (Note: our tests have used a 0,001 g/ml). TONG'S(43) 1990 experiments have shown that the transretinoic acid may stimulate or inhibit epidermic keratinocyte proliferation in rats. He observed that EGF (Epidermis Growth Factor) and TGF Alfa (Transformation Growth Factor Alfa) stimulates the synthesis of DNA in the presence of RA (Retinoic Acid). On the other hand TGF Beta (Transformation Growth Factor Beta) inhibits EGF and the synthesis of DNA in the event of a low RA dose. These findings might suggest that the differentiation of the retinoid effects in that proliferation is due to an increase in the positive response of the keratinocytes to the production of peptides or EGF, maintaining epidermic homeostasis, Thus, in order to become mitogenic, keratinocytes increase TGF Alfa and inhibits TGF Beta. Based in these observations one can conclude that in the Psoriasis syndrome, the hyper-proliferation of the epidermis is due to an exaggerated incidence of m-RNA and of the TGF Alfa peptide rather than TGF Beta. This suggests that the excess may cause an hyper-proliferation of the epidermis. Nevertheless retinoids may cause a similar response in normal skin according to the regulation of the extracellular Ca mechanism. Perhaps the main retinoidal mechanism of immuno-regulation of the epiderrnis with specific and complex responses to endogenous and exogenous stimuli, may become better understood. PENN(32) reported that a suplement of vitamins A, C and E enlarges the functions of immunologic cellular mediators, with a significant rise of the absolute number of T lymphocytes, followed by a conseguent increase of T4 lymphocytes (helper) and stabilization of T8 1ymphocytes (suppressant) in response to phitohemoaglutinine (chemical mediator increased in the presence of vitamins A, C and E). In our present study we will be referring specially to alltrans retinoic acid and its function in the immuno-regulation and immuno-stimulation in both humorous immunity (lymphocytes Beta lineage) and cellular immunity (lymphocytes T lineage). CAMPOS(6). Many article reports that vitamin A provides the inter-cellular communications. Prostagladines E2 synthesized by the epidermis, in the presence of all trans retinoic acid induces blood stimulation favouring a rapid leukocyte response. It is therefore clearly related to the improvement of the defensive mechanism against bacteria, viruses, parasites and malignant and non-malignant tumoral processes. - The platelets exposure to collagen and trombine, are activated when they adhere to the sub-endothelium tissue. New platelers then connect themselves to these activated forms and get also activated, releasing arachidonic acid, PAF (Platelet Activating Factor) and ADP. - Trombine and collagen have different receptors in the platelet membrane, whose action generate biochemical reactions leading to the secretion of platelets granules. One of these reactions is the release of IP3 (Prostaglandine IP3), the second best inductor of platelets activation. IP3 plays the role of calcium ionophore increasing the calcium concentration. - Increased calcium concentration activates phospholipases (enzyrnes), like A2 which release arachidonic acid. - Tromboxane A2, a potent vasoconstrictor and platelet aggregator, is generated as a subproduct of arachidonic acid. Therefore, it is necessary to inhibit or compete with the release of arachidonic acid. Consequently the platelets should be stimulated to produce the cyclo-oxigenase enzyme in order to obtain a small quantity of tromboxane A3, which is physiologically inactive and reduces platelet aggregation and maintain the vasodilatation. - The production of prostaglandine I2 (a potent vasodilator and anti-platelet aggregator) in the endothelium is not significantly inhibited and the physiologic activity of a new prostaglandine I3 is added to prostaglandine I2. The resulting effect is the change of the homeostatic equilibrium with an increase of vasodilaration condition, and lower platelet aggregarion. Abb(1), 1982. - ABB(l) reports that a prolonged use of retinoic acid even in non-toxic concentration inhibits the spontaneous activitv of T-killer lymphocyte, a natural human product. Abb also warns against the prolonged use of acid vitamin A. The aim of this study is the observation oflocal tissue alterations, in Newzealand white rats, after using all trans retinoic acid 0,1% (dilluted having biopresence of O,02%). Studies were done with random statistic technique improvement in the local tissue quality of the treated group, the absence of the tissue injuries, an increase of colagen and elastic fibers in the histological analysis. Twenty-eight healthy adult rats were observed in a Random study: 14 males and 14 females. The observation lasted rwo months. 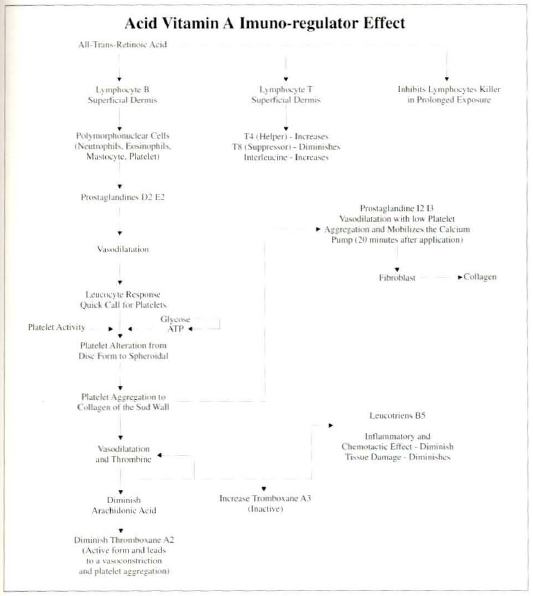 Seven males and females belonged to the control group A that received only aqueous-alcoholic vehicle, and seven males and females belonged to group B, treated with all trans retinoic acid 0,1 % injections (biopresence 0,02%) diluted 1:4 with Prilocain 1% with vasoconstrictor to all trans retinoic acid 0,02%. All the animals were placed in individual cages, inside an accoustic room of 4 x 4 square meters and permanent temperature of 22°C, artificial white light of 100 watts, 12 hours on light, alternating with 12 hours of darkness. The rats received quantitative and qualitative standard food ration at the first hour of light. The animals were weekly injected 2 hours after been fed. The study is based on 0,1 ml of All Trans Retinoic Acid 0,1% superficial intradermic injection (dilluted), in the abdominal region, previously cleaned with 92 GL alcohol. These injections were done with insuline type of syringe each 7 days in the same place of the former one. There were no changes neither in the animals' activity nor in their search for food. Biopsies in the group B performed 60 days after the experiment been started, showed the reorganization and a significant increase of collagens fibers, stained by Hematoxiline - Eosine. The elastic fibers stained by Silver base also showed significant increase number. The corneous layer became thinner and epidermic stratum granulosum became thicker. Elastic and collagen fiber s stained by Masson trichromic showed similar microscopic aspects (Figs. 1 and 2). Fig.1 - Microscopic aspect. 200 X. Before treatment Hematoxilin-eosin coloration. 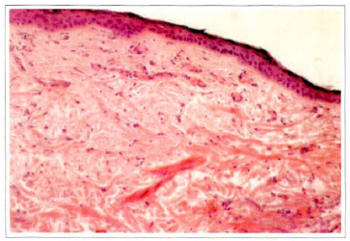 The left side shows the thin epidermis, a weak attachament of dermo-epidermis and desorganization of collagenous fibers, in rats. Fig. 2. Microscopic aspect. 200 X. After treatment Hematoxilin-eosin coloration. The right side shows the increase of colagenous fibers and the epidermis more organized. It is visible the improvement of the dermo-epidermic adesion, in rats. Two months after intradermic ali trans retinoic acid 0,1 % injection (dilluted) in healthy adult rats, no toxic effect to the tissue was observed. Each application showed intensive local edema and erythema, but no tissue necrosis. The animals' skin turgor increased. There were neither deaths nor harmful effects. Hisrologically, the corneal layer became thinner, the collagen and the elastic fibers increased and became better reorgarnized. 351 patients (320 females and 31 males) underwent to this treatment. All of them presented thin wrinkles, skin creases photo aged skin, senile skin and elastosis. 1. Local cleaning for oiled excess removal with alchoolic lotion. 2. All trans retinoic acid 0,1 % intradermic injections (dilluited with biopresence of O,02%) under each thin wrinkles and creases, disseminated in all the face compromised regions, distant 1 cm from each other, were performed with 1 ml syringe and 12 x 4,5 gauge needle. 3. No more than 5 ml of All trans Retinoic acid 0,1 % (dilluted) is injected per session. This injected volume represented the dermis saturation limits per session. 4. Immediately after, topic retinoic acid 0,1% is applyed and the patients are submitted to blue light irradiation in a frequence of 340 nm, distant 125 inches from the face for 20 min. 5. Home treatment - During the treatment retinoic acid cream 0,1% is applyed every night. If the skin is very sensitive and white we reduce the percentage to 0,05%. At morning the patients need to use an umectant cream with photo protetion at least Sun Protection Factor (SPF) 20. After the all trans retinoic acid 0,1% injection (dilluted) and topic cream applyed, hich, mild burning sensation and erythema occured in the first two days, followed by skin expholiation from the fifth day on. The stratum corneum reduction, stratum granulosum and the basal layer anchored fibers augmentation, reorganization and increase of the collagen fibers. Despire of the lack of comproved teratogenic collateral effects in humans, the patients with possible pregnancies, signed an information consent regarding the treatment envolved. The patients were watched 6 and 12 months after the treatment. 23% of the total group required an extra treatment 6 months afterwards. Suplementary weekly dosis were injected during the three next weeks. The other 77% remained with the results obtained. No further complementary treatment was necessary (Figs. 3,4 and 5). Fig.3 - Female Patient 38 years old with eye lid wrinkles. (A) Before treatment. (B) After treatment with all trans retinoic acid injectable and cream 0,1 %, 15 sessions, once a week. Shows the decrease of the fine wrinkles and the improvement of the skin texture. Fig.4 - Female Patient 65 years old with severe elastosis and dry skin. (A) Before treatment. (B) After treatment with all trans retinoic acid injectable and cream 0,1%, 15 sessions. Shows the decrease of the improvement of skin texture. Fig.5 - Female Patient 65 years old with severe elastosis and dry skin. (A) Before treatment. (B) After treatment with all trans retinoic acid injectable 0,1 % and cream. Shows the decrease of wrinkles on lips and nasolabial fold and the improvement of skin texture. No secundary effects were detected. The blood from patients who underwent 15 session has shown no changes in the retinol level (retinoato, retinil and retinoic acid) during the treatment or at the end of it, maintaining within the normal level: 20 - 25 ug/dl limits. Normal level in the serum and in the G.T. Gama dosage. Our ide a of changing the current use of all trans retinoic acid 0,1 % (dilluted with biopresence of 0,02%) treatment, was first occurred due to the necessity of reducing the time of the treatment by the anxiery of the patients to reach the desired final results. Another detail was related to the skin hiperpigmentation after two or more years of acid continuous use even in the patients that followed the correct evening application and skin sun protector during the day. Two main aspects concurred to create this procedure: 1 - Several publications(8,14,7,33,26,23,17,42,9,40) on chromarographies of all trans retinoic acid 0,1% demonstrate that retinoic acid binding protein remain stable in 340 nm absorptance level. This corresponds to the blue light visible spectrum after 20 minutes of exposure. These laboratorial findings were transported to the office for routine clinical purposes, to reduce the treatment period of time, avoiding tissue damages by the long period of all trans retinoic acid use. 2 - Intradermic liquid injectable all trans retinoic acid was the second attempt to potencialize its local effects, to exclude the topic cream slow skin absorption period. In conclusion, the combined topic and injectable all trans retinoic acid has reduced the treatment period by its potencialized effects compared to the traditional topic cream use. 1. ABB, J. et al - Effect of Retinoic Acid on the Spontaneous and Interferon-Induced Activity of Human Natural Cells Killer. Int. J. Cancer., 30:307, 1982. 2. ARENS, J. F.; VAN, RAP D. A. - Synthesis of some Compounds Processing Vitamin A Activity. Nature, 157:190, 1946. 3. BAILLY, C. - Retinoic Acid Inhibits the Production of Collagenase by Human Epidermal Keratinocytes. Jour Invest Dermat., 94:47, 1990. 7. CANTAROW, A; SCHEPARTZ, B. - Bioquímica da Vitamina A W.S. Sauders Company Philadelphia. p 160, 1969. 8. CARR, E; PRINCE, F. - Color Reactions Attributed to Vitamin A. Bio Chem J. 10:497, 1926. 9. CHANDHARY, L. et al - Metabolism of All-Trans (113H) Retinil Acetate in Young Rats Tests. Ann nutr Metab, 30:1, 1986. 10. CONNOR, M. J. - Oxidation of Retinol to Retinoic Acid as Requirement for Biological Activity in Mouse Epidermis. Cancer Research., 48:7038, 1988. 11. CONNOR, H. J. et al - Inhibition of UVB Carcinogenesis by Retinoic Acid. Cancer Research, 43:272, 1983. 14. ESCRIBANO, J.; GRUBB, A.; MENDEZ, E. - Identification of Retinol as one of the Protein HC Chromophores. Bioch and Bioch Research Communications., 115:1424, 1988. 16. FORBES, P. D. et al - Enhancement of Experimental Photocarcionogenesis by Topical Retinoid Acid. Cancer lett 7:85, 1979. 17. GLOVER, J. - Factor Affecting Vitamin A Transport in Animais and Man. Nutrition Society. 42:20, 1983. 19. JARDILLIER, J. C.; RALLET, A. - Metabolisme de la Vitamine A et des retinoids. Bull Cancer (Paris), 73:180, 1986. 20. KARRER, et al - Zur Kenntrus des Vitamins A aus Fischtranen II Helv Chim Acta. 14:1431, 1931. 21. KLIGMAN, A. M.; FULTON, J. E.; PLEWING, G. - Topical Acid Vitamin A in Acne Vulgaris. Arch Dermatol. 99:469, 1969. 22. KLIGMAN, A. M.; GRAVE, G.L. ; HIRASE, R. et al - Topical Tretinoin for Photo Aged Skin. Journ. Amer. Acad. Dermat. 15:836,1986. 23. KUTNER, A. et al - Synthesis of Coenzyme A Esters of Retinoic Acid: Intermediate in Vitamin A Metabolism. Biochemistry. Prc. Nat. Acad. Sci. 83:6781, 1986. 24. LARRY, SCHOEFF M. S. - Vitamin A / American Journal of Medical Technology. 49:447, 1983. 25. LASNITZKI, I. - The Effect of Excess Vitarnin A on Mitosis in Chinch Heart Fribroblast in Vitro, Exp. Cell Res. 8:121, 1955. 26. LOPEZ, OTIN C.; GRUBB, A.; MENDEZ, E. - Lipocalins. Arch Biophvs. 228:544, 1984. 27. MALONE, W. - Studies Evaluating Antioxidants and β-Carotene as Chemo Preventives. Am. J. Clin Nutr. 53:3055, 1991. 28. MESIEWICZ, J. - Topical Treatment of Multiple Actinic Keratosis of the Face with Arotrinoid Methyl Sulphone (RO 14-970) Cream Versus Tretinoin Cream: A Double Blind. Journ. Am. Ac. Dermat. 24:448, 1991. 29. MOORE, T. - Vitamin A. Elsevier; New York 1957. 30. McCOLLUM, E.; DAVIS, M. - The Necessity of Certain Lipoids in the Diet During Growth. J. Biol Chem. 15:167, 1913. 32. PENN, N. D. - The Effect of Dietary Supplementation with Vitamin A, C and E on Cell-mediated Immune Function in Elderly long stay Parients: A Randomized Controlled Trial. Age and Aging. 20:169, 1991. 33. PERVAIS, S.; BREWK - Protein HC - Lipocalins. Science. 228:335, 1985. 34. RIEMERSMA, R. A. et al - Risk of Angina Pectoris and Plasma Concentrations of Vitamin A, C and E, Carotene. Lancet, 337:1, 1991. 35. ROLLDMAN, O. et al - Vitamin A in Skin and Serum Studies of Acne Vulgaris, Atopic Dermatitis. Ichthyosis Vulgaris and Lichen Planus. Brit. Journ Dermat. 113:404, 1985. 36. ROSENTHAL, D. S. et al - Changes in Photo Aged Human Skin Following Topical Application of All-Trans Retinoic Acid. Soc. Invest. Dermat. Inc. 95:510, 1990. 37. SINGH, V et al - Pre-malignant Lesions: Role Auto-oxidant Vitamins Beta Carotene in Risk Reduction and Prevention of Malignant Transformation. A.M.J. Clen Nutr. 53:3865, 1991. 38. SUTTER, C. et al - Aberrant in Vitro Expression of Keratin K13 Induced by CN2+ and Acid Vitamin A in Mouse Epidermal cell Lines. Experimental Cell Research. 19:183, 1991. 39. STEEP, W - Versuche Uber Futtenrung Met Lipoidfrein Nahrung. Biochem Z. 22:4452, 1990. 44. THORNE, E. G. - Topical Tretinoin Research. An Historical Perspective. Cambridge Medical Puhlication Ltd. 1990. 45. VARANI, J. et al. - All-Trans Retinoic Acid Stimulates Growth and Extra Cellular Matrix Production in Growth-Inhibited Culture. Human Skin Fibroblast. Journ. Investig. Dermat., 94:717, 1990. 46. VARANI, J. et al. - Retinoic Acid Stimulation of Human Dermol Fibroblast Proliferation is Dependent on Sub Optional Extra Cellular CA2+ Concentration. Amer Journ Pathol. 136:1275, 1990. 47. WALD, G.; HUBBARD, R. - Synrhesis of Rhodopsin from Vitamin A. Proc Nat Acad Sei. 36: 92, 1950. 48. 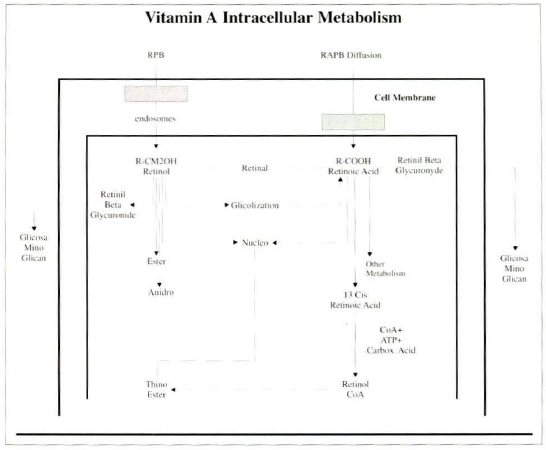 WEBER, F. - Biochemical Mechanisms of Vitamin A Action. Proc. Nutr. Soc. 42:31, 1983. 49. WILSON, E. L.; REECH, E. - Plaminogen Acrivator in Check Fibroblast: Induction of Synthesis by Retinoic Acid: Synergism with Viral Transformation and Pherbol Ester Cell. Am. Journal Anat. 15:385, 1978. 1. To Tomnus Química e Farmacêutica Ltda. 2. To Salomão Zoppi - Pathology Ward for their keen lab analysis. 3. To G. Pozzan - Pathology Ward of Santa Casa de São Paulo. I - Clinical director of the Plastic Surgery Ward, Hospital Saint Paul - São Paulo, SP, Brazil. II - Immunologist and Allergist Hospital Adventista de São Paulo - São Paulo, SP, Brazil. III - Assistent Physician Plastic Surgery Ward, Hospital Saint Paul - São Paulo, SP, Brazil.